U.S. retail sales of medium-duty trucks overall nudged higher in September, led by Class 6, the only sector to improve, WardsAuto.com reported. Classes 4-7 sales reached 19,173. That was up 4.3% from 18,390 a year earlier, according to Ward’s. “The mantra of the medium-duty space continues to be business as usual,” ACT Research President Steve Tam said, referring to an expected drop from August volumes. That month’s sales hit 21,370. “Basically, we expected, based on typical seasonal activity, to see medium-duty sales drop 10-12% sequentially, which they did,” he said. Class 7 sales were flat at 5,224 compared with 5,226 a year earlier. Class 6 soared 36.6% to 6,110 compared with 4,474 in 2017. Ford said customer demand through the middle of the year has been strong for its F-650 and F-750 models. “We’ve seen strong growth in sales as a wider group of dealers gain traction in both selling and servicing the medium-duty trucks. Stocking levels have also recovered from shipping constraints, which affected the market early in the year,” said Dawn McKenzie, trucks and commercial vehicles product communications manager for Ford. Ford Motor Co. had a 34% share with Class 6 sales of 2,106. 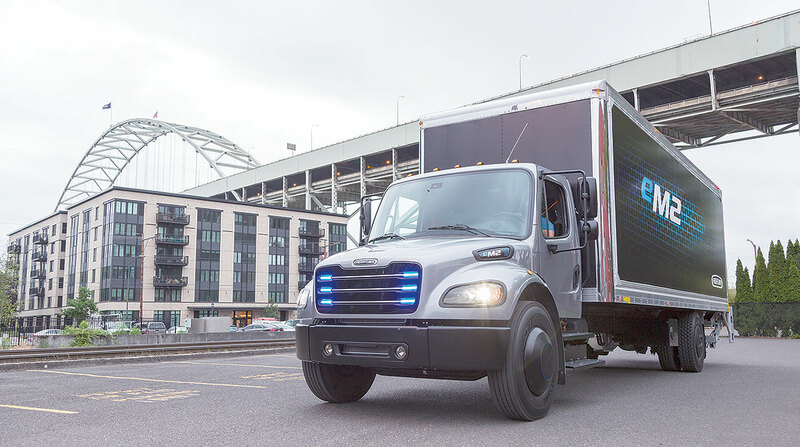 Freightliner, a unit of Daimler Trucks North America, was next with sales of 1,713.
International Truck, a division of Navistar Inc., saw sales reach 1,348 compared with 846 a year earlier. Classes 4-5 sales dropped 9.8% to 7,839 compared with 8,690 in the 2017 period. In Class 5, Ford is the dominant manufacturer but sales fell by 754 units in September compared with a year earlier. “On the Ford drop, I think they are just up against some very tough comparisons. September 2017 was the second-best September in Ford’s history for the Class 5 market,” Tam said. In Class 4, Freightliner fell to 66 sales compared with 275 a year earlier. In related news, the North American Council for Freight Efficiency released a guidance report on medium-duty electric trucks. The report found that daily, return-to-base urban cycles less than 100 miles are well-suited for battery-electric drivetrains and that the primary justification of commercial battery-electric vehicles is to meet zero-emissions objectives. “The electrification of freight trucks is just starting, but it has the potential to revolutionize the industry just as the dieselization of locomotive engines revolutionized freight transport in the 1940s and 1950s,” according to the report.